Triple C combines the best moving storage containers for rental in Massachusetts, Rhode Island, Connecticut, New Hampshire, Maine and Vermont with custom tailored service and competitive rates. Our units provide ground level access, large doors, and solid steel construction. Our high security containers are the perfect solution and can be used to meet even the toughest needs, offering instant inexpensive space, and storage to your site. 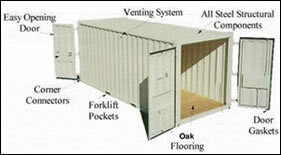 Our steel storage containers are ISO standard containers and require no foundations or structural assembly. They are wind and water-tight to protect your items from the elements.